I have made a lot of tomato tarts this year. Elra's delicious ricotta tomato tart in puff pastry and my easy French tomato tart w/ Gruyere and mustard. 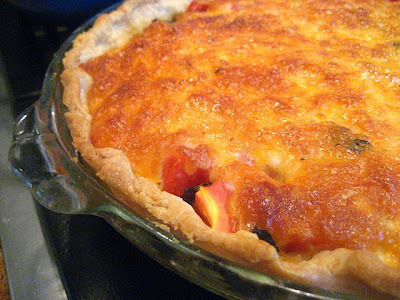 However, I have always wanted to try this Southern style tomato pie with mayo and cheddar cheese. Elise posted this recipe and someone wrote in her comment section "can I skip the mayo? I am on a diet." Her answer was "nope, mayo is an important ingredient in this recipe". If you are on a diet, then save this one for when you can spare the calories because this is rich!!!! I made a few minor changes to Elise's recipe. I used a little less mayo and I sauteed the onions instead of throwing them in raw. 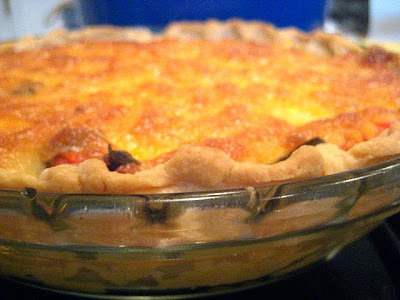 Roll your pie crust out and fit into a 9" glass pie dish. (Make sure you are working with cold dough or freeze it for a few minutes before baking). Bake for 10 minutes until the crust is turning a light golden color. While your pie crust is baking, saute the onions in a little olive oil until translucent. Set aside. Squeeze as much moisture as you can out of the chopped tomatoes, using either paper towels, a clean dish towel, or a potato ricer. *(Since I used plum tomatoes, I skipped this step, because they have a low moisture content). 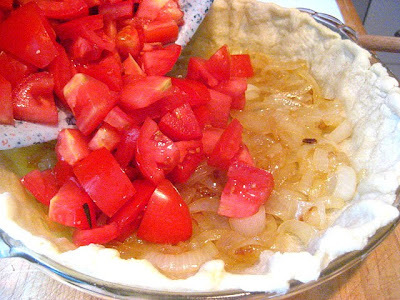 Sprinkle the bottom of the pre-cooked pie shell with the cooked onions. Spread the chopped tomatoes over the onions. Sprinkle the sliced basil over the tomatoes. 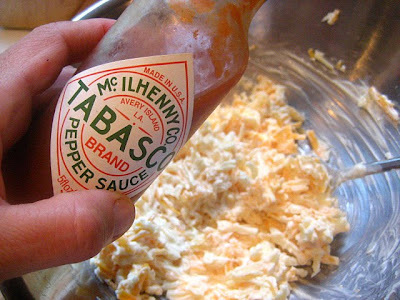 In a medium bowl, mix together the grated cheese, mayonnaise, Tabasco, a sprinkling of salt and freshly ground black pepper. The mixture should be the consistency of a gooey snow ball. Spread the cheese mixture over the tomatoes. Place in oven and bake until browned and bubbly, anywhere from 25 to 40 minutes. This was a little rich for my blood, but I skipped dessert and went right for a second slice! I see a tomato tart in my future, but which one to choose? They all look delicious. 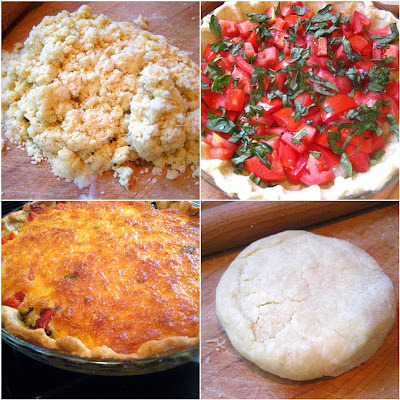 You can never have too many tomatoes and tarts/pies are a great way to use them up. Looks great Stacey! Your baking magic is back! This is one gorgeous pie. Great call on cooking the onions first. One more Stacey recipe goes into my MUST TRY file. I've never had anything like that but boy, does it look good! this does look great. i wish it wasn't so hot these days though. i can't bare to turn on the oven. Very nice - I tried to make a tomato pie earlier this summer, and unfortunately, it was a little flat. I have pie envy now. Great recipe for using up the summer tomatoes! This looks like the perfect dish for a cheat day! Aww, thanks for mention me again. You are very sweet. Very nice tomato tart Stacey. I like that you sauteed the onions instead of using raw ones. That would make a nice difference. Sometimes it's quicker and easier to skip that step, but I believe cooking the onions is well worth the effort. Seriously, I will just do all of your baking from here on in if you'll just cook dinner for me everyday. I'll save this after I loose 20! for real!